Inland Empire Therapy Dogs, Inc. (IETD) is an all volunteer 501(c)(3) non-profit organization. “Our mission is to use therapy dogs to promote comfort, wellness and joy to those in healthcare settings, educational systems and in our communities.” Our teams are registered with and insured by the national therapy dog certifying organization, The Bright and Beautiful Therapy Dogs, Inc. and our services are always free of charge. Each of our teams has passed a rigorous certification test proving that they are qualified for therapy dog work. 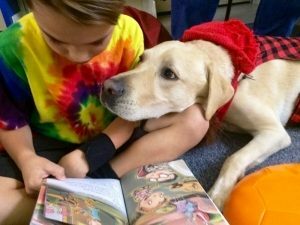 In addition to our teams being evaluated and registered with Bright and Beautiful, we are also an Affiliate of the Reading Education Assistance Dogs (R.E.A.D.®) program. 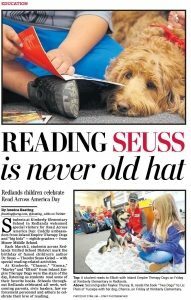 IETD’s program, “Reading With a Furry Friend” covers both the San Bernardino and Riverside counties. Often, when reading is difficult or delayed, children are apprehensive to read aloud in fear of making mistakes and being ridiculed. 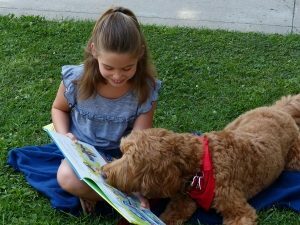 This motivating program enables young children to comfortably read to our dogs, thus gaining confidence and improving their skills. Not to mention, it’s fun too! Inland Empire Therapy Dogs’ R.E.A.D. programs are flexible to meet the needs of the individual school and their students. One option may consist of a series of visits, typically once a week for an eight week period. Ideally, students meet one-on-one or in pairs with a dog/handler team to read for about 30 minutes. A second back-to-back 30 minute session would accommodate additional students. This program offers the opportunity for the teacher to track the progress of their students. We also offer classroom visits to introduce the benefits of our R.E.A.D. program. IETD is happy to work with teachers and administration to meet the needs of your students and schedule.